Homemade version of my favorite classic Girl Scouts cookies- Thin Mints! I have been buying Girl Scout cookies every year for as long as my stomach can remember. Nothing beats the real thing, but what happens once I’ve run out of cookies? Or what about if I have a sudden craving during the summer when Girl Scout cookies are no longer available? I can’t just wait around until the next cookie season. I’m not patient like that. It’s too bad I wasn’t interested in joining Girl Scouts as a child. Looking back, I think it would have been fun and a great experience. I was too much of an indoor plant (and still sort of am). I prefer indoor activities like painting, dancing or cooking. 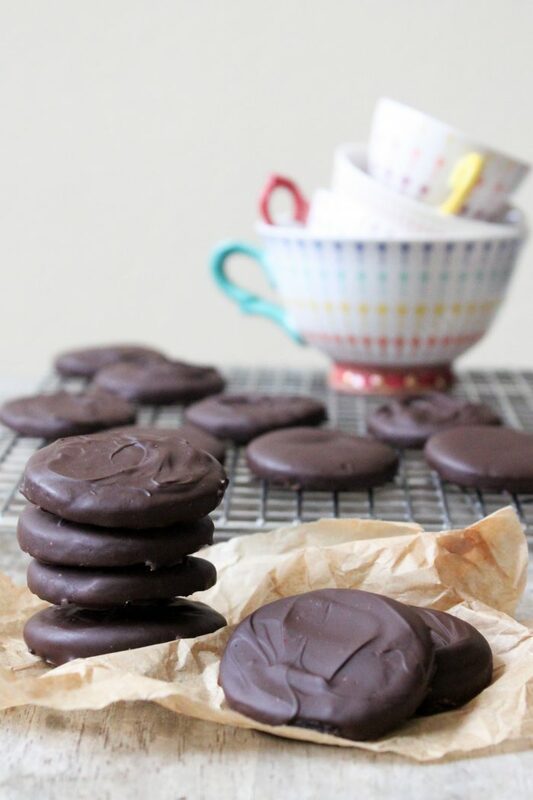 Unlike my samoa cookies, these thin mints are very simple to make. The cookie dough is easy to work with and can also be used to make homemade oreos! Instead of butter or shortening, I used coconut oil to make these cookies. Coconut oil seems to be becoming quite popular. Its a great vegan alternative for cookies and other baked goods that use butter. Coconut oil once had a bad reputation for having too much saturated fats. Most of the time, they were referring to partially hydrogenated coconut oil. No need to go into that discussion. I say, coconut oil is a baker’s friend. Be sure to use refined coconut oil. Unrefined coconut oil will change the taste of your product. Its better for actual coconut based dishes. 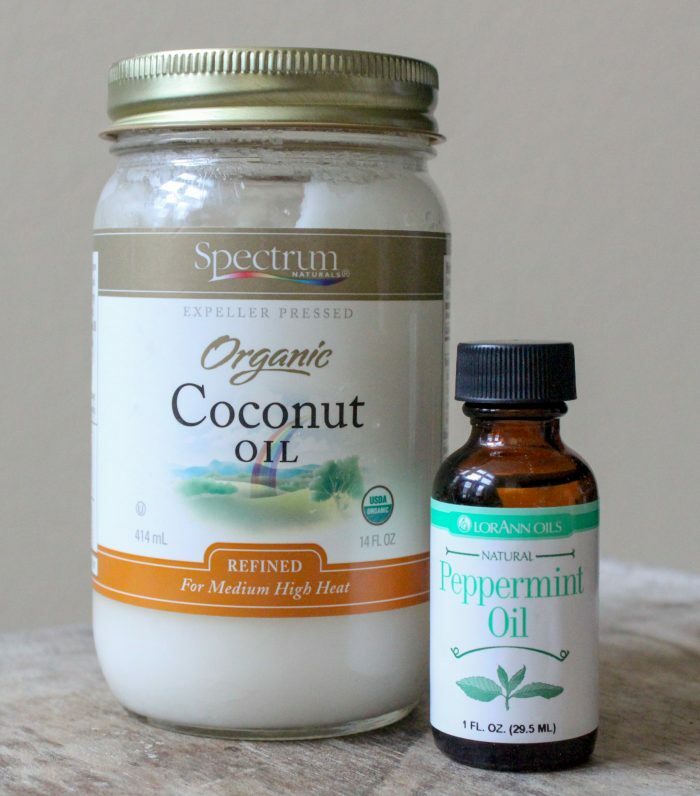 Both coconut oils can be easily found at markets such as Trader Joe’s, Whole Foods, or Sprouts. I’ve even seen it at Ralphs and Vons. There are lots of different brands out there, but Spectrum is my favorite. I also think they make the best shortening. 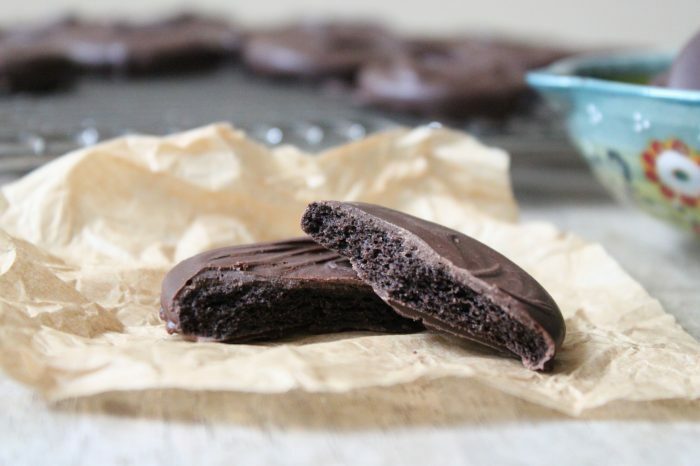 Peppermint oil is another key ingredient for these amazing thin mints. Peppermint oil is used to flavor the dipping chocolate. Be sure to use food grade peppermint oil. Stay away from peppermint extract! Extract will cause the melted chocolate to seize up. Peppermint oil is pure oil, meaning no water. Unlike peppermint extract which is a combination of alcohol and water. I bought my peppermint oil from King Arthur’s Flour. 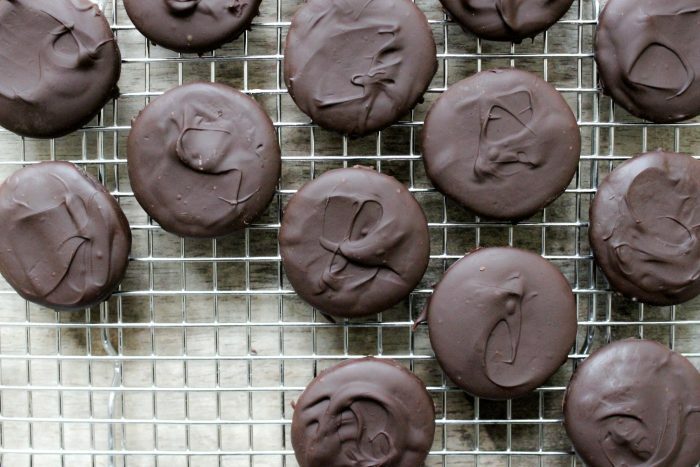 Next year, I plan to do a side by side taste and compare these homemade Thin Mints to the real stuff! In a medium bowl, whisk together flour, cocoa powder, salt, baking powder, and baking soda. Set aside. In the bowl of a stand mixer with a paddle attachment, beat together sugar and coconut oil on medium-high speed. Beat until mixture if fluffy. Reduce speed to low and add milk, egg, and vanilla paste. With the mixer still on low, slowly add the prepared flour mixture. Mix until just combined. Divide dough into two equal parts. Flatten the two halves and wrap tightly in plastic wrap. Chill in the refrigerator for 30-45 minutes until dough is cold and firm. Work with one dough at at time. On a lightly floured work surface, roll dough to 1/4”. Using a 1 3/4” round cutter, punch out cookies. Transfer to prepared baking sheet. Space cookies about 1/2” apart from each other. Bake in preheat oven for 15 minutes, rotating sheets halfway through baking. Let cookies cool in the pan for a couple minutes before transferring to a wire rack to cool completely. Line baking sheet with parchment paper. Place clean wire rack on top. Set aside. Once chocolate is melted, remove bowl from heat and set over a folded kitchen towel. Do not set bowl on marble or other kitchen surface that will cool down the bowl. Working with one cookie at a time, drop cookie into melted chocolate. Using a fork to scoop cookie from the bottom. Tap fork on the edge of the bowl to let any excess chocolate drip from the cookie. Transfer cookies to prepared wire rack to let chocolate harden. If desired, make swirl marks on top of chocolate. Otherwise leave alone and your cookies will be smooth on top. *If chocolate is taking longer than 10-15 minutes to harden, place cookies in the fridge. However, if you end up doing this, you will have to store your cookies in the fridge. Otherwise they will melt at room temperature. I have reposted the recipe. It guess it wasn’t showing up properly. I had a great time making these cookies. Only issue I encountered was 15m was not long enough in my oven. They came out great, but lacking in the crisp department. Next time I need to leave them in a couple minutes longer. You are very talented, I’m having a wonderful time dabbling in your recipes! That’s wonderful to hear, AshLee! 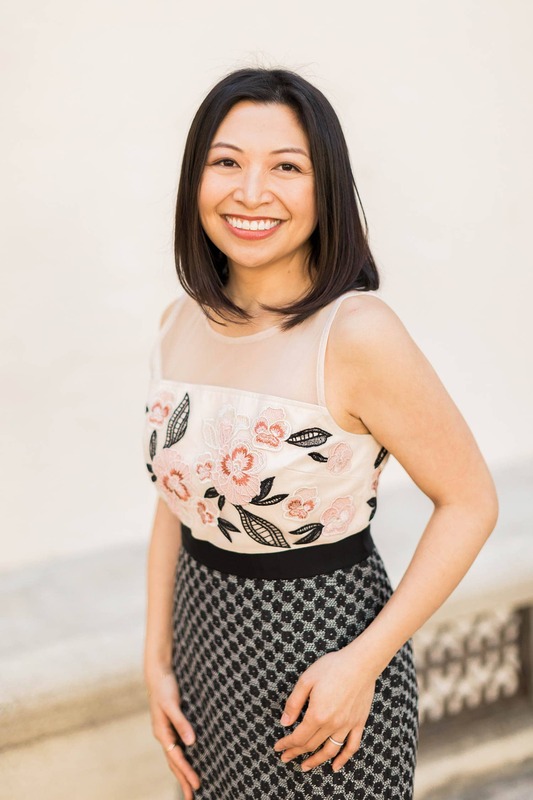 Thank you so much for visiting my site and trying out the recipe! I’m sorry that the cookies weren’t as crisp as you hoped for. Ovens temps and times can be tricky sometimes. Hope you’ll make it again! These were super yummy and just like the real thing. The cookies plain tasted a little blah but then with the chocolate minty coating – yum! I used mint extract without a problem. I also added in about a tablespoon of crisco into the chocolate mixture to give the cookies a nice sheen.